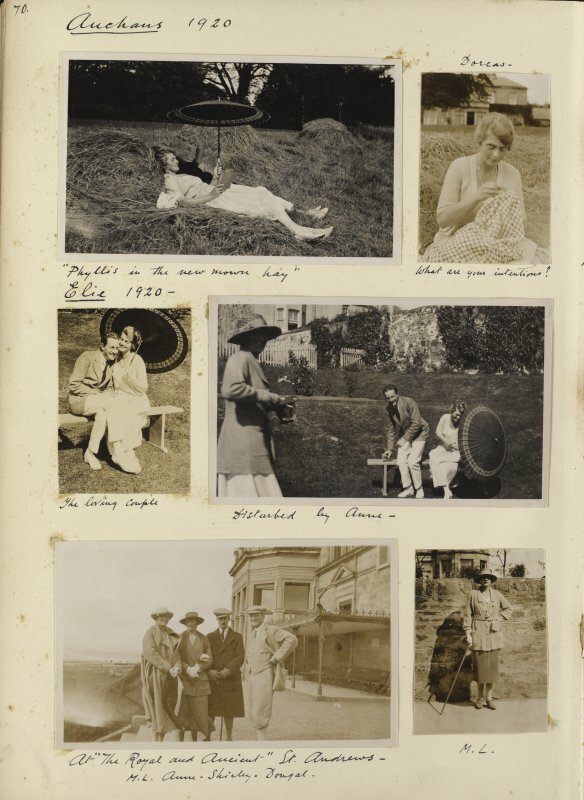 Six photographs showing views of Auchans House, Dundonald. 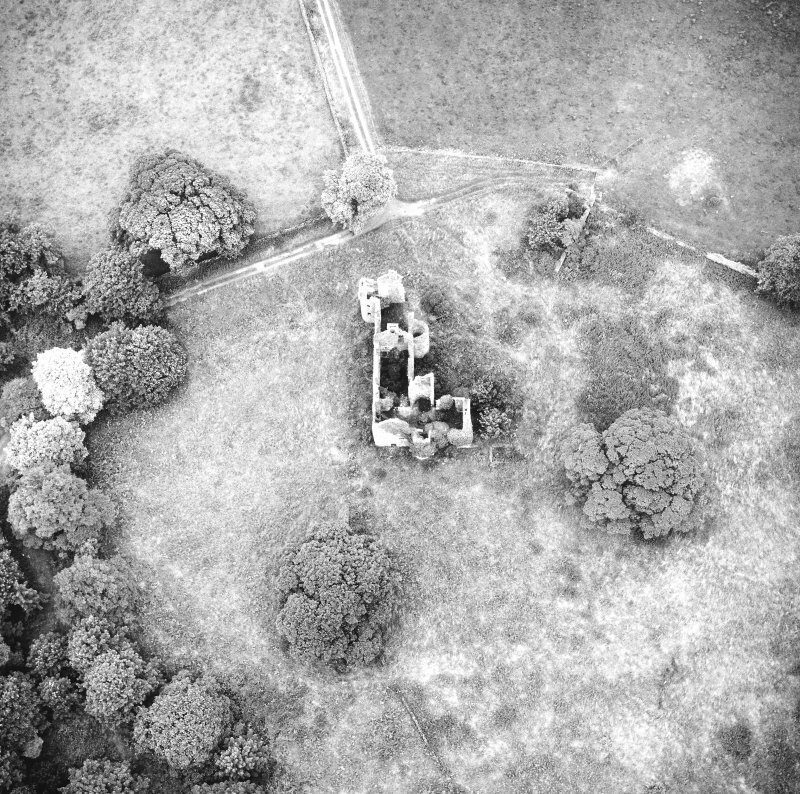 General oblique aerial view of Auchans House, taken from the E.
General oblique aerial view of Auchans House, taken from the SSW. 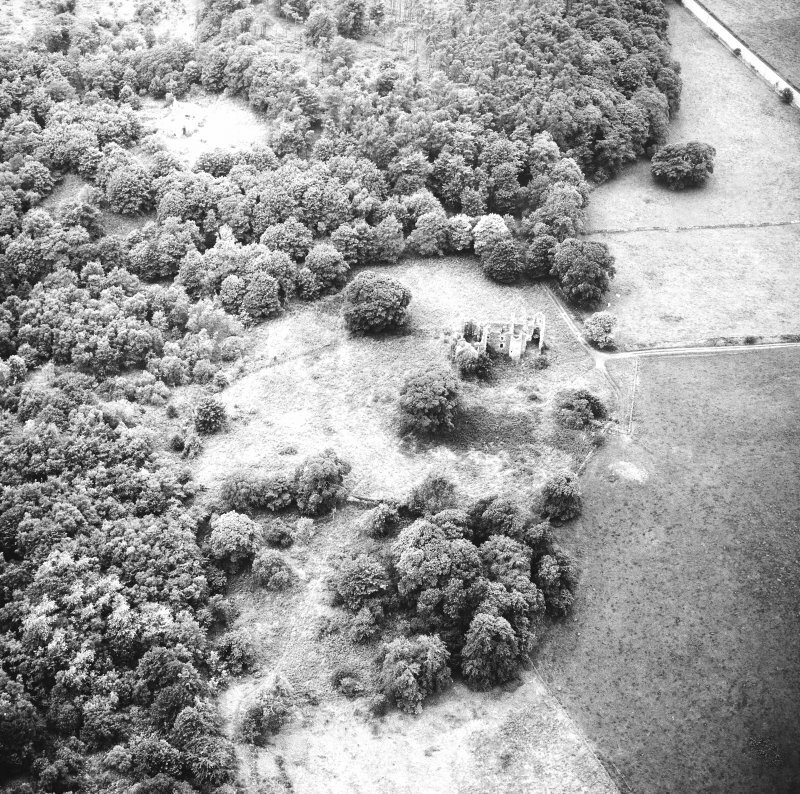 General oblique aerial view of Auchans House, taken from the NNE. 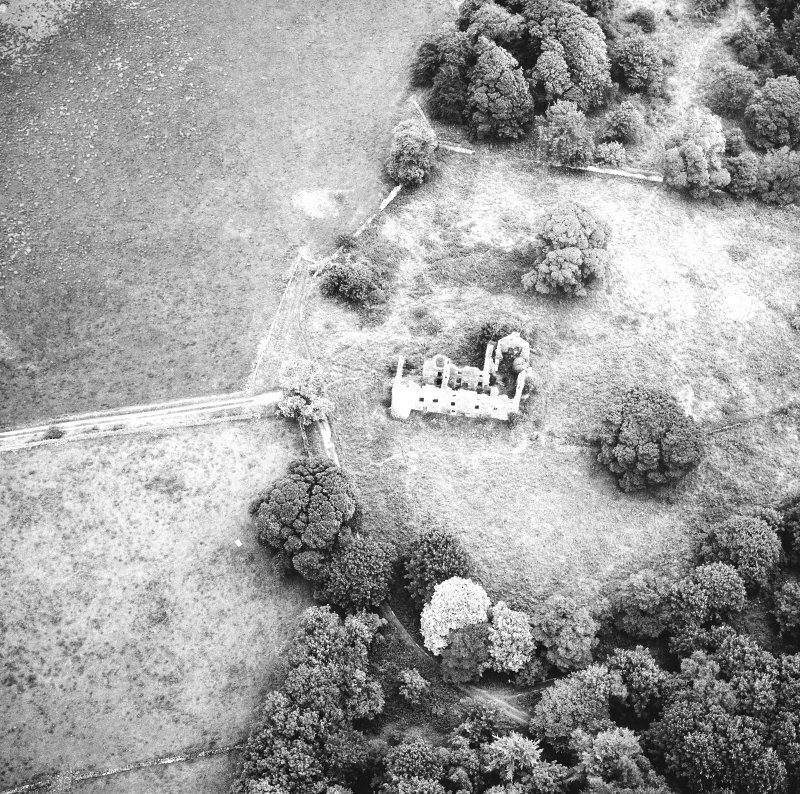 General oblique aerial view of Auchans House, taken from the SW.
General oblique aerial view of Auchans House, taken from the NW. 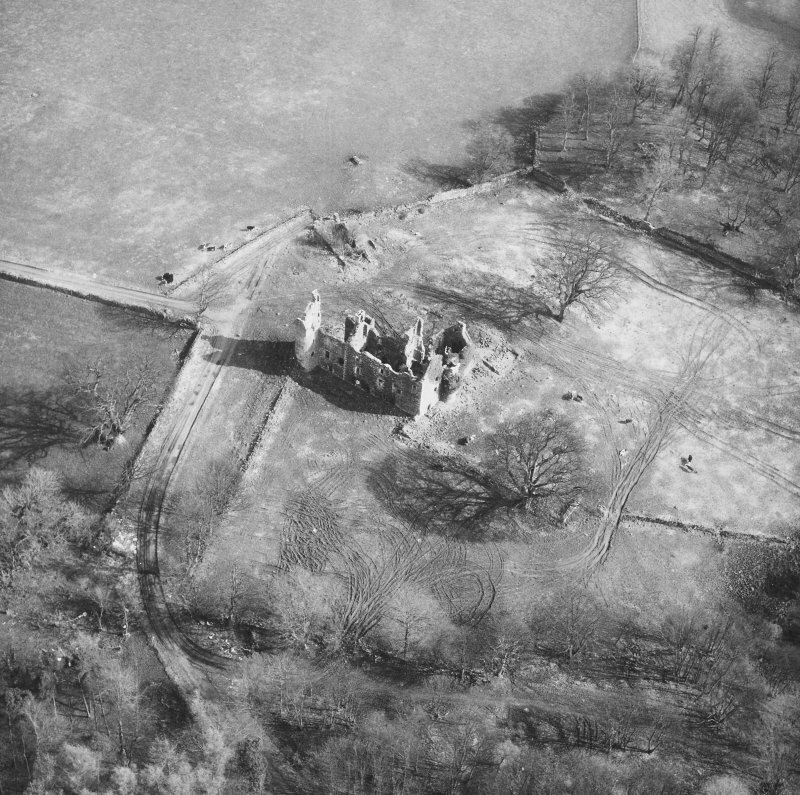 General oblique aerial view of Auchans House, taken from the NE. 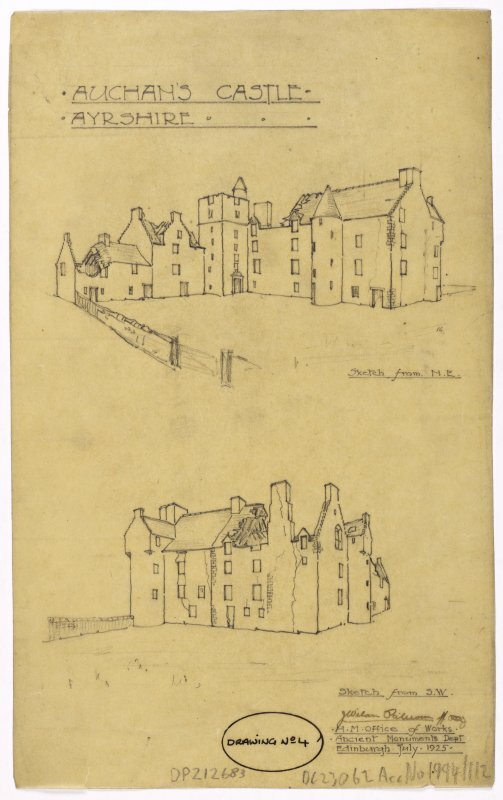 Four photographs showing views of Auchans House, Dundonald. 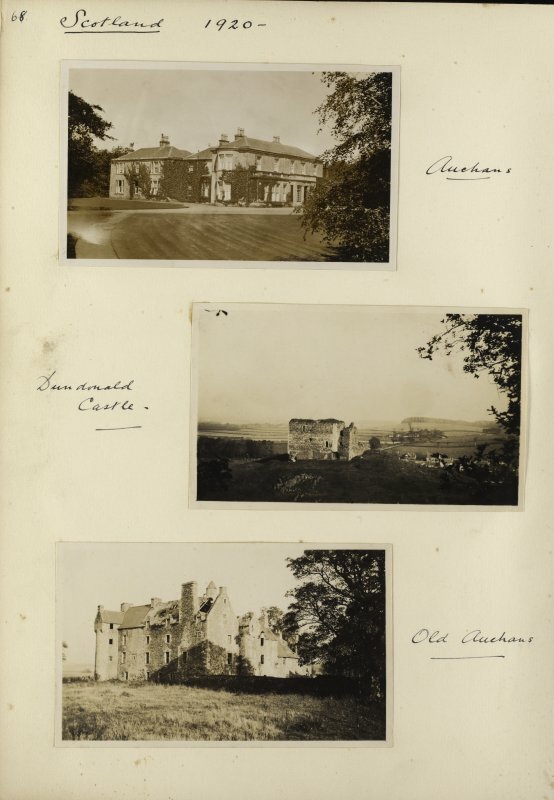 Four photographs showing views of Auchan House, Dundonald Castle and Old Auchans. 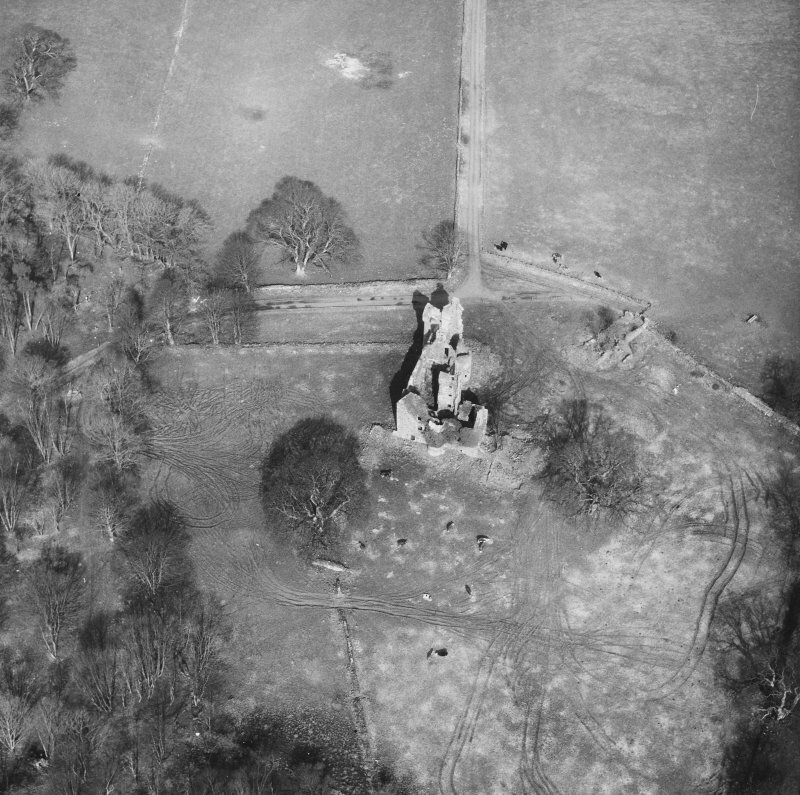 General oblique aerial view of Auchans House, taken from the SE. 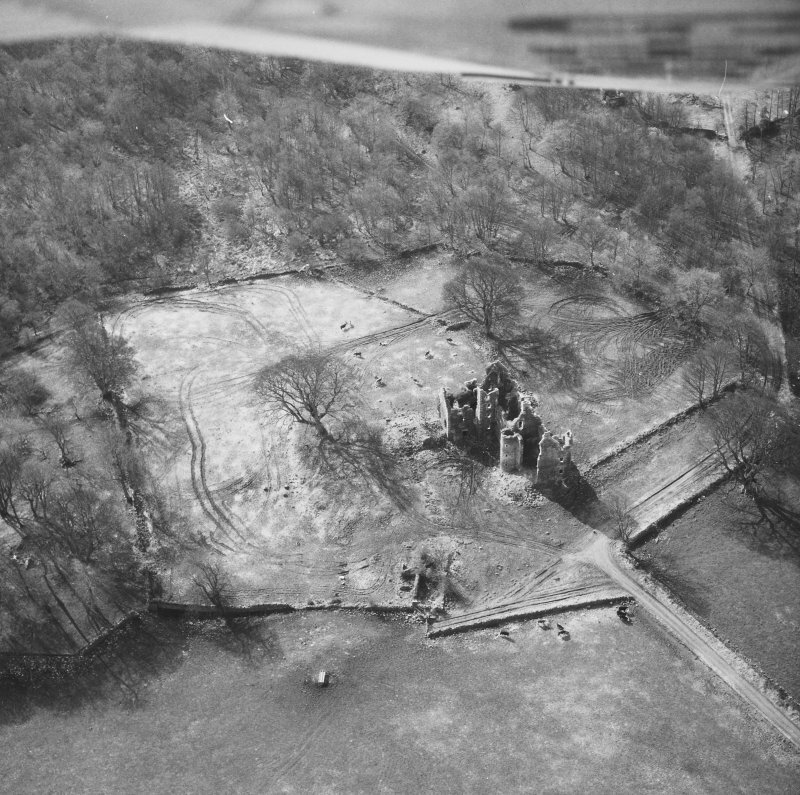 General oblique aerial view of Auchans House, taken from the W.
Auchans Castle, formerly a large, impressive mansion, is now a complete ruin. 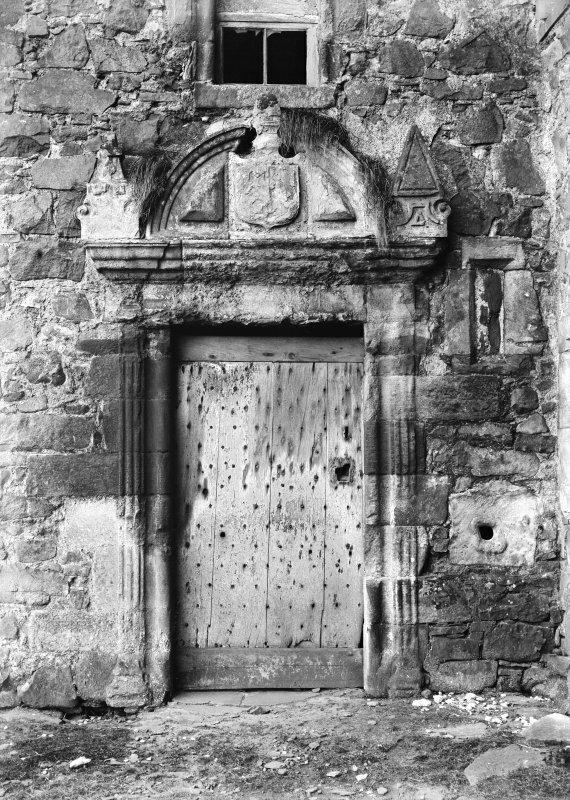 It dates from various periods, although the majority of it was built in 1644 (Macgibbon and Ross note a stone bearing this date on one of the windows of the N wing). 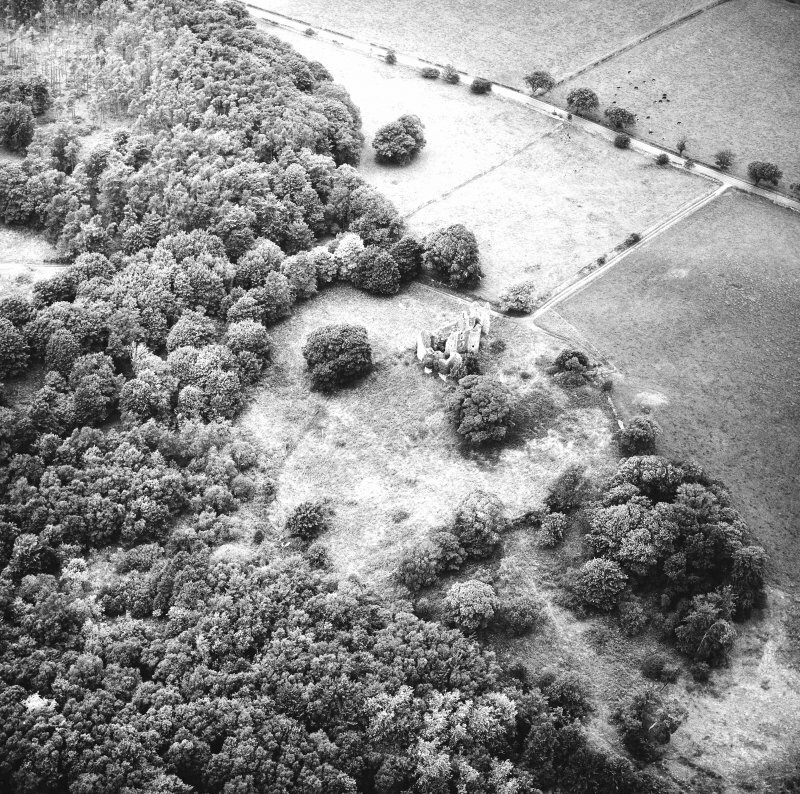 Tranter states that almost certainly there was an earlier nucleus as there were Wallaces of Auchans early in the 16th century. 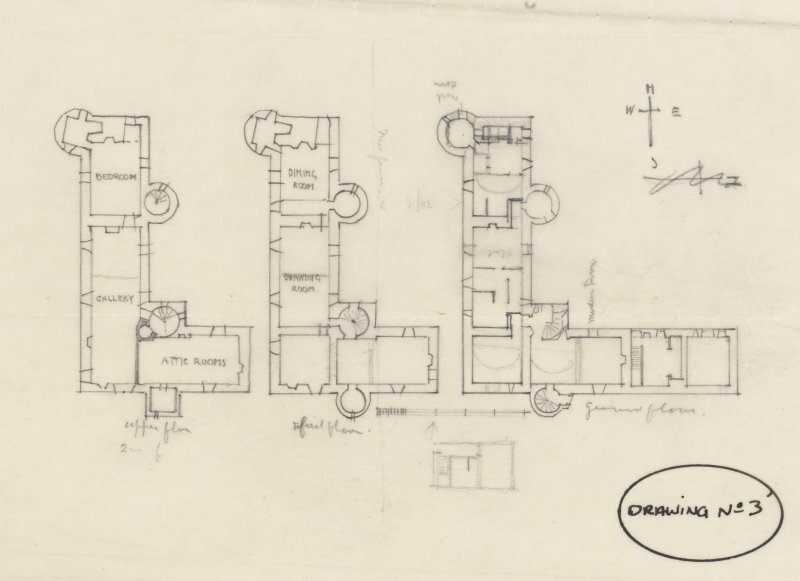 It now consists of a long main block three storeys and an attic in height, running E-W, with a wing a storey longer projecting to the N. It is just possible that the W end of the main block, which is of slightly different construction to the rest and is vaulted while the main house is not, represents the original, Z-planned, fortalice. D MacGibbon and T Ross 1887; N Tranter 1965. 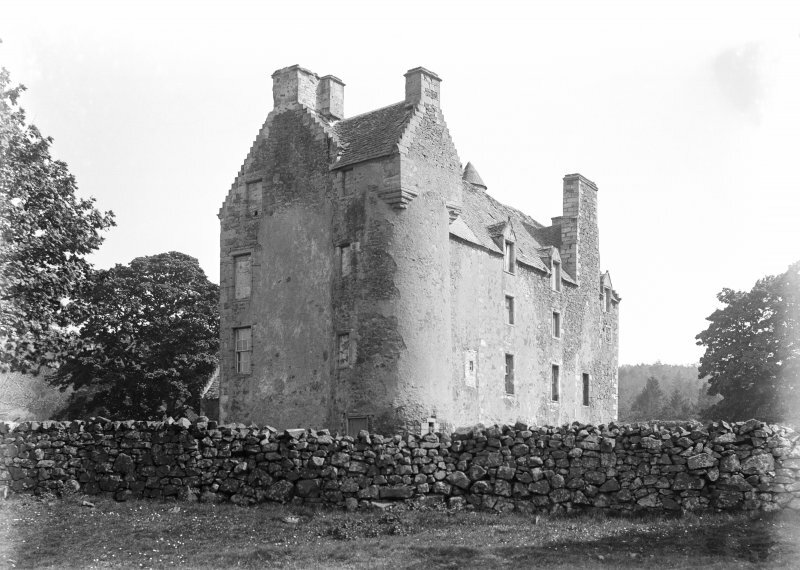 Auchans, a large, mainly 17th century mansion built on the L-plan. 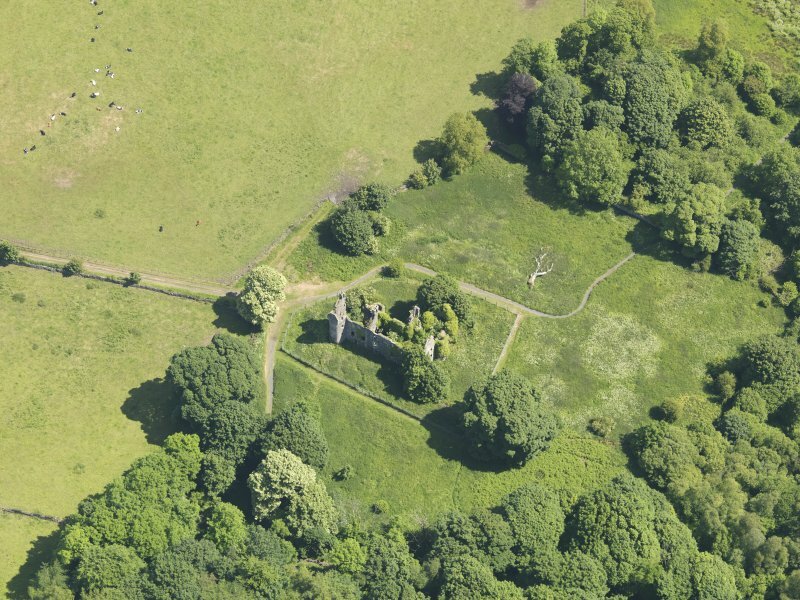 It is a total ruin and its walls are in poor condition. Otherwise it is as described above. The date stone is to be seen in the S wing. 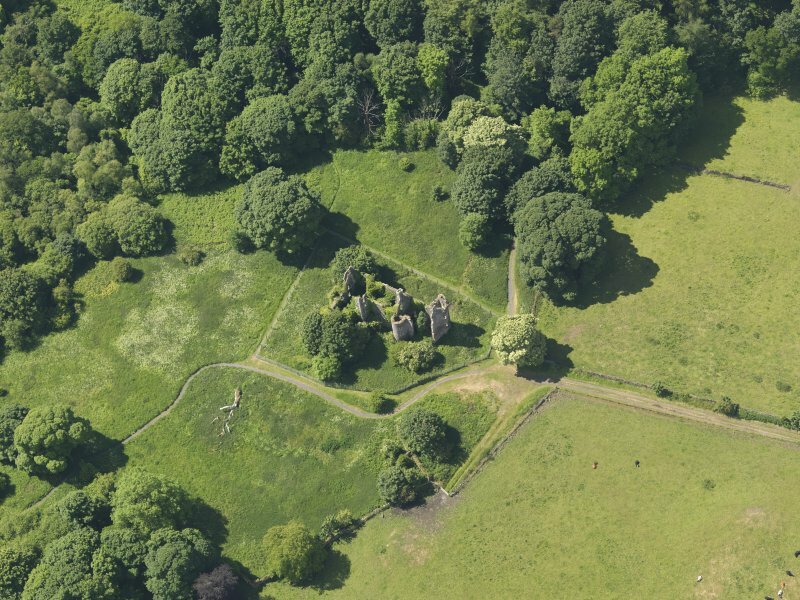 There is an extensive walled garden around the building. 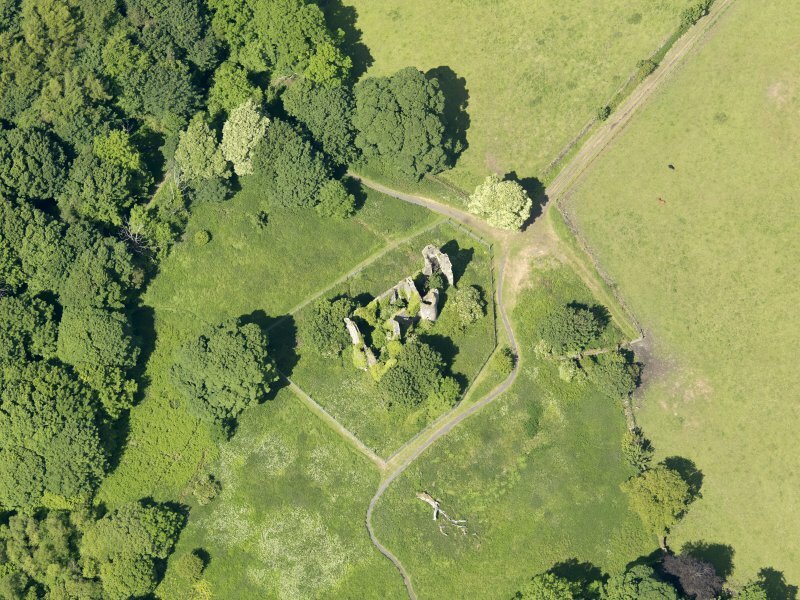 No change to the previous reports; the E end of the S wing is collapsed as is the NE corner of the N wing. Elsewhere walling is in a dangerous state. 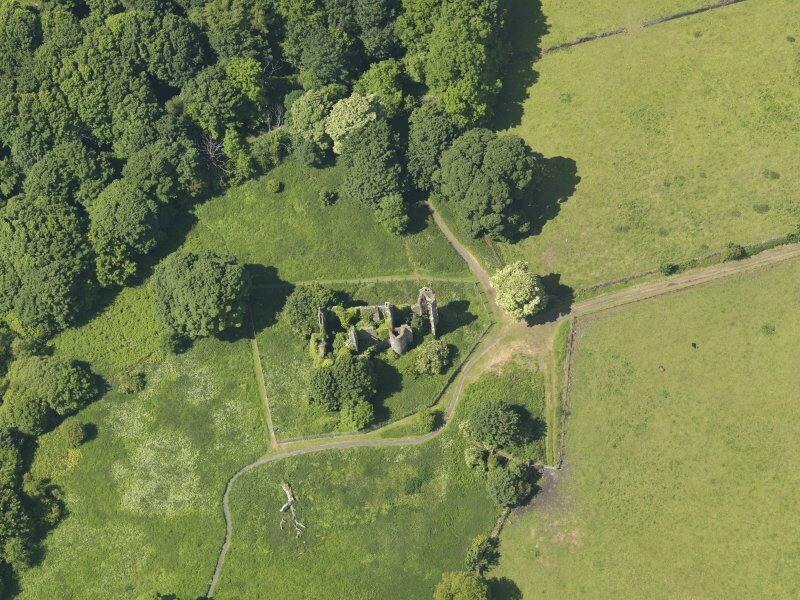 The remains of Auchans, a T-plan house of late 16th century date converted to the L-plan during the early to mid 17th century, stand about 1km W of Dundonald. 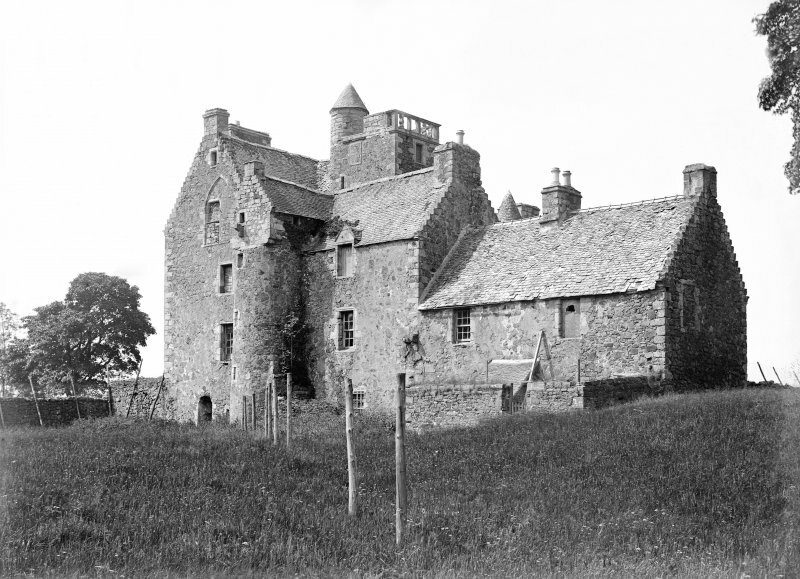 The high gabled main block of the original house (14.8m by 4.65m within walls 0.9m thick) was of three principal storeys; the basement was vaulted and a stair-tower was extruded central to the S side. The terrace on the S side of house was originally enclosed within a courtyard. 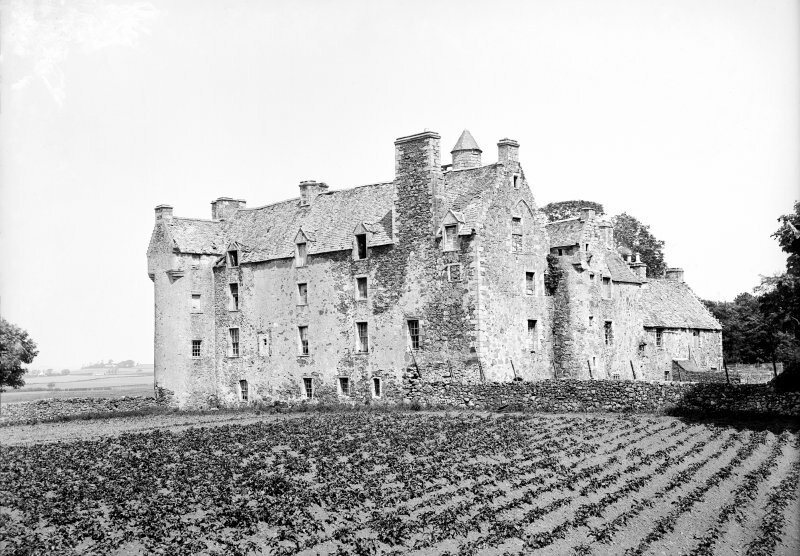 A wing, three storeys and a garret in height (10.2m by 5.17m within walls 0.9m thick), was subsequently added at the W end of the N wall, and a stair-tower, with a Renaissance-style doorway, was provided in the re-entrant angle. 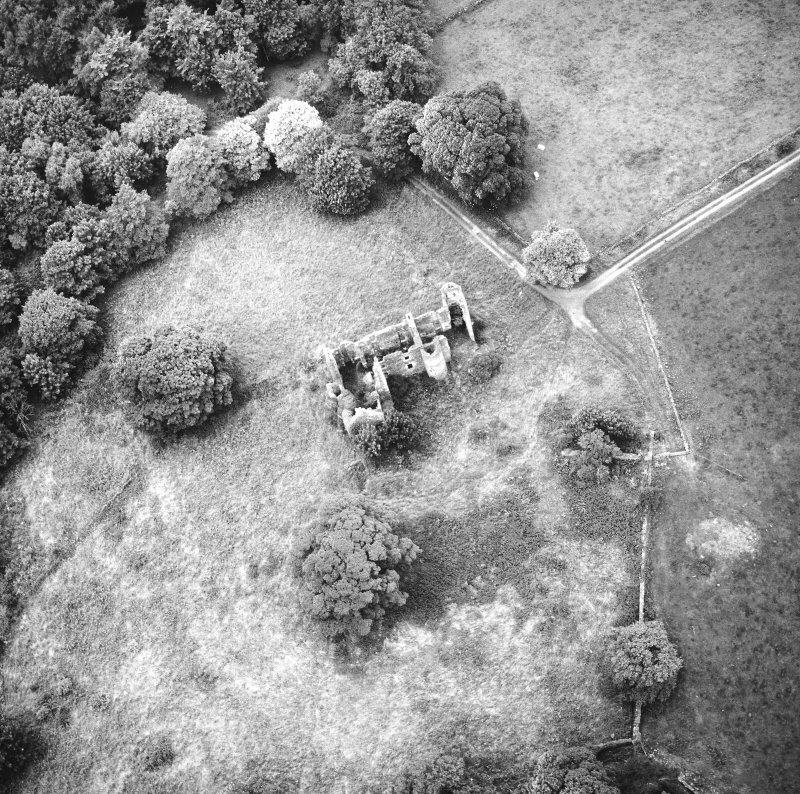 The wing was further extended on the N by the addition of a block (9.35m by 5.35m within walls 0.8m thick) with towers at its NW and SW angles. 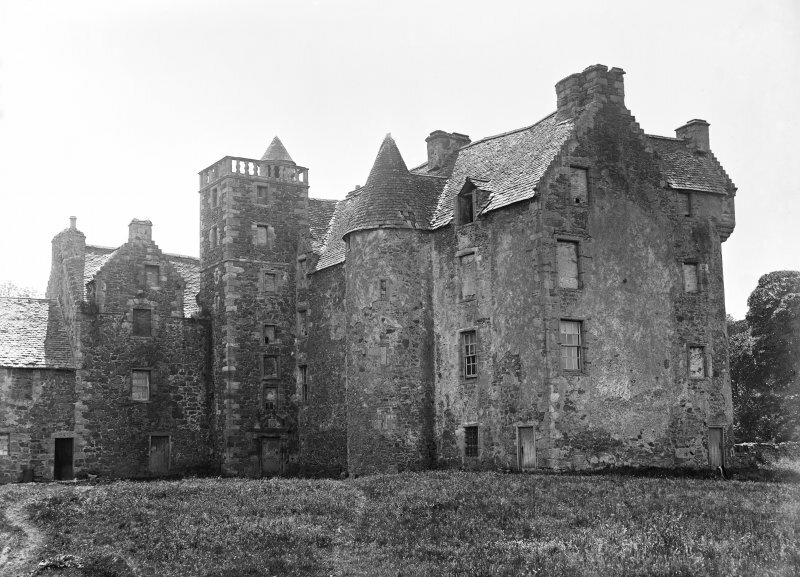 The basement of the block was vaulted; the NW tower was corbelled square and the gables were crow-stepped. 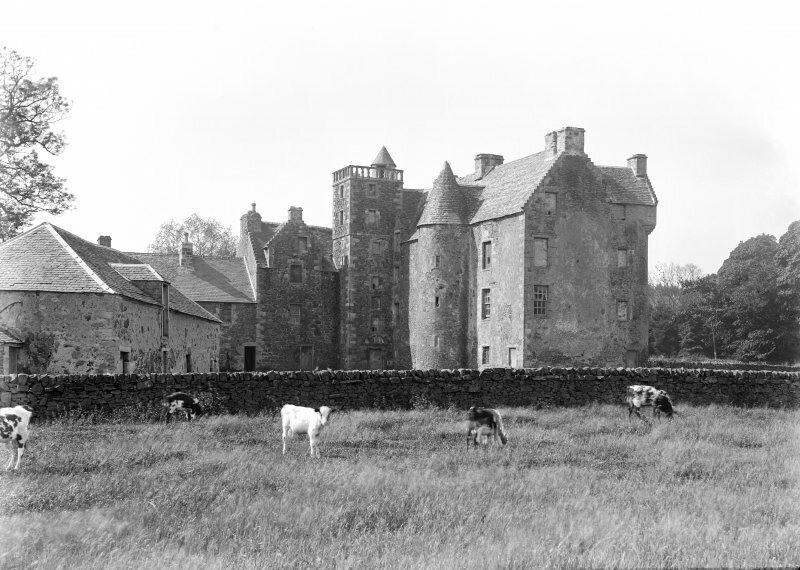 Ranges were subsequently added on the S and E sides of a courtyard on the E. In 1527 the estate of Achynche (Auchans) became the property of Wallace of Dundonald, and in 1640 it passed to Sir William Cochrane of Cowdon. 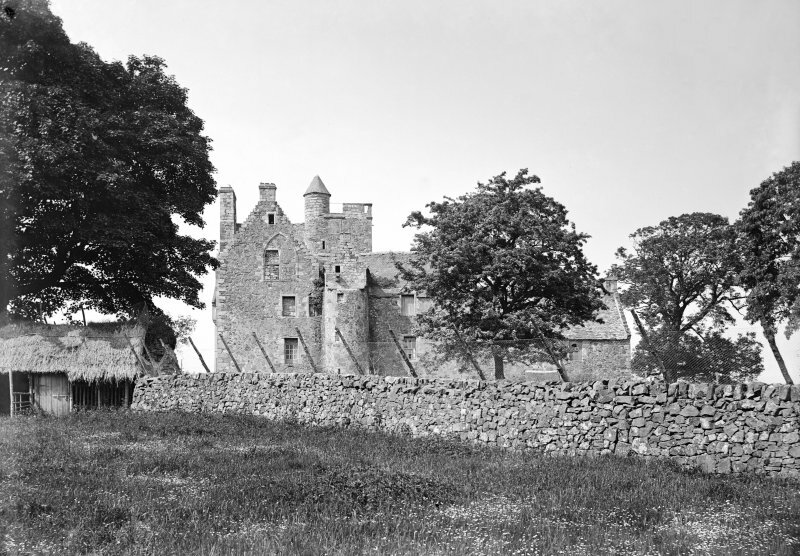 In 1876, it is recorded that 'one of the side angles has the date of 1644 and another of 1667'; the initials WCD (William Cochrane of Dundonald) and ES (Eupheme Scott) also occurred in two places. 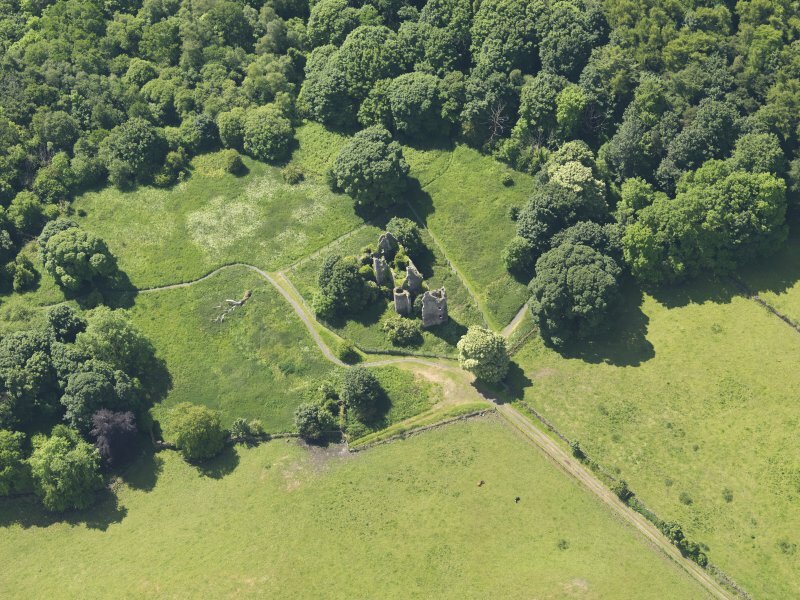 The house stands in its policies amidst a series of stone-walled parks, probably those referred to by Abercrummie. 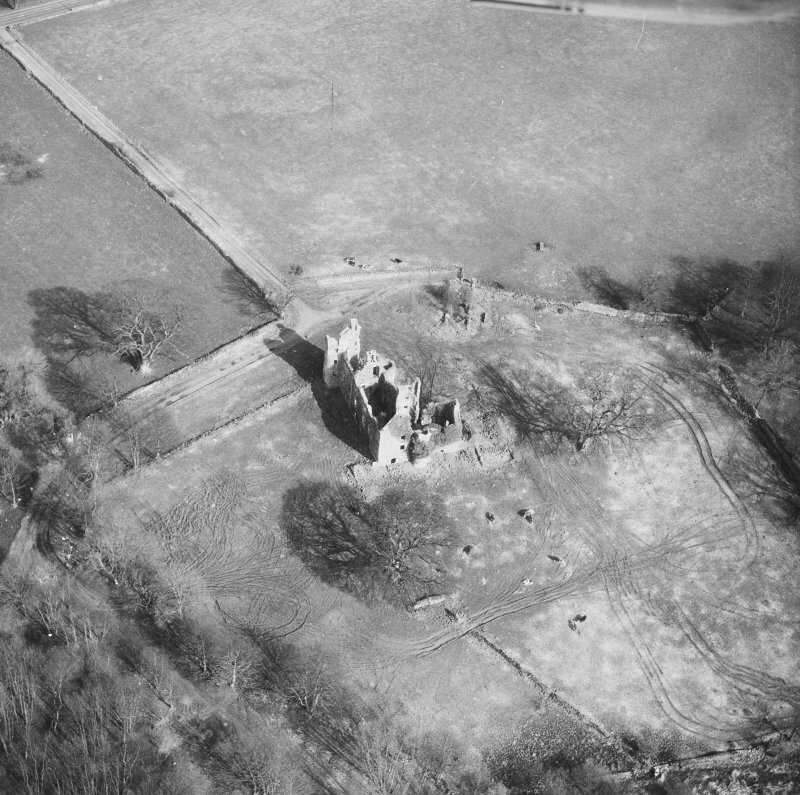 (Visible on vertical air photographs, (OS 78/109/001, flown 1978). 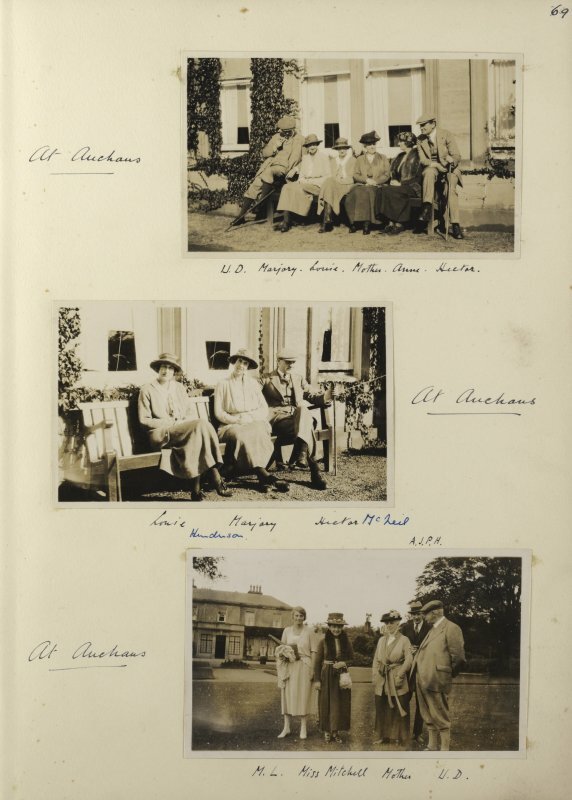 OSA 1793; R W Billings 1845-52; J Paterson 1863-6; J Kirkwood 1876;A H Miller 1885; D MacGibbon and T Ross 1887-92; W Macfarlane 1906-8; J H Gillespie 1939; J Strawhorn 1959; N Tranter 1962-70; RCAHMS 1985, visited (IMS) February 1985. 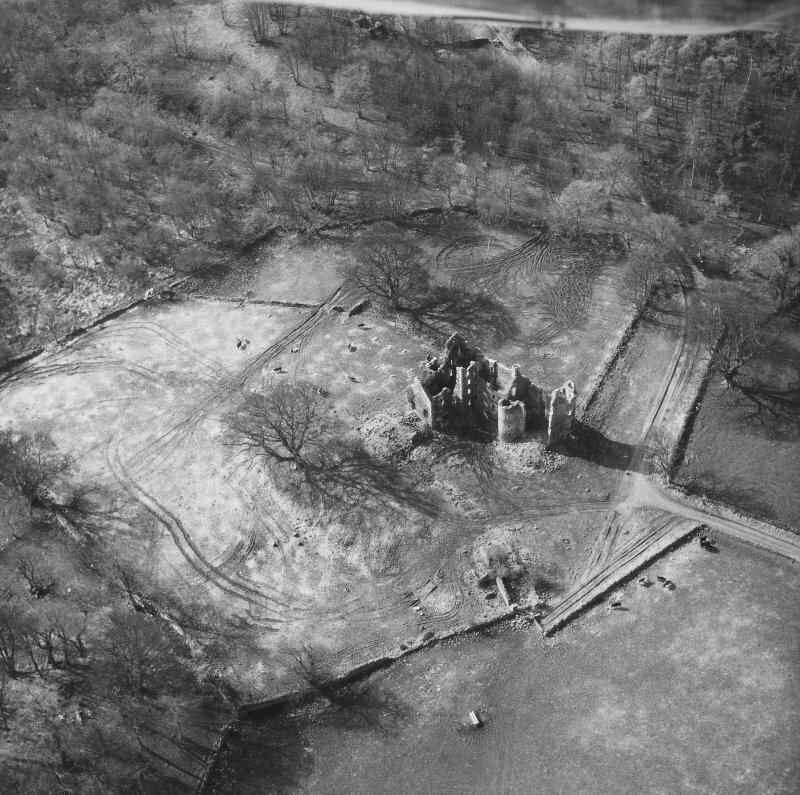 Mock-military mansion on an L-plan with a square balustraded stair-tower, erected by Sir William Cochrane, later Earl of Dundonald. 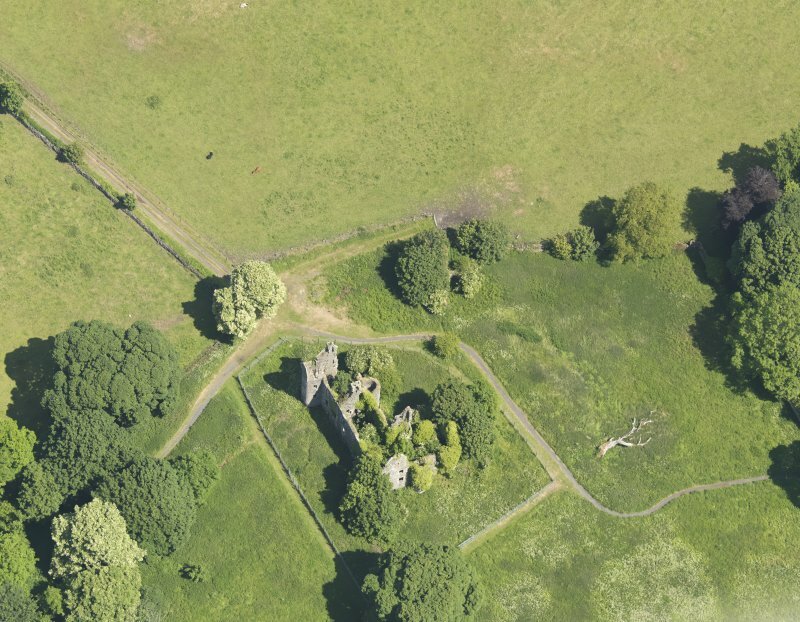 The walls stand only some 650-750mm thick, revealing the castle's residential rather than military use. The entrance doorway is in Jacobean court style, whilst the façade features large dormers, string-courses, corbels and crowsteps. The south gable unusually features a large traceried Gothic window. 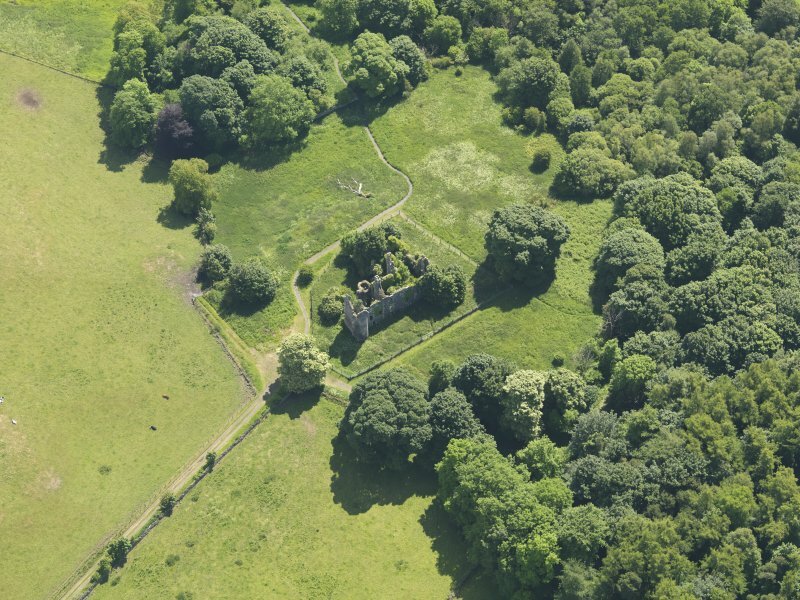 A walled garden sits to the north. 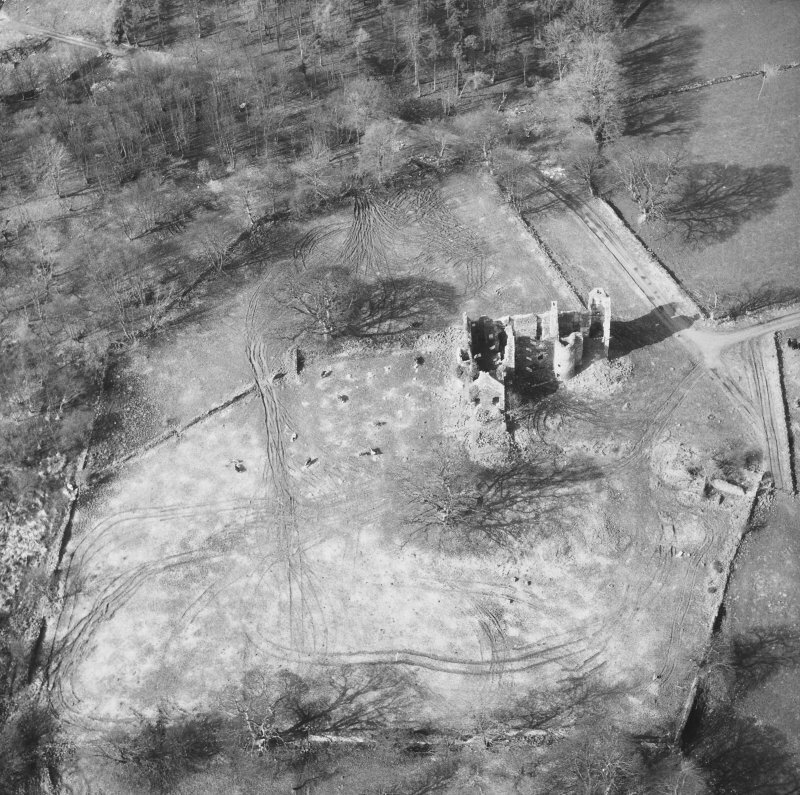 The west wing has been lengthened, probably during three separate alterations, whilst the roof was lost during the 1920s. 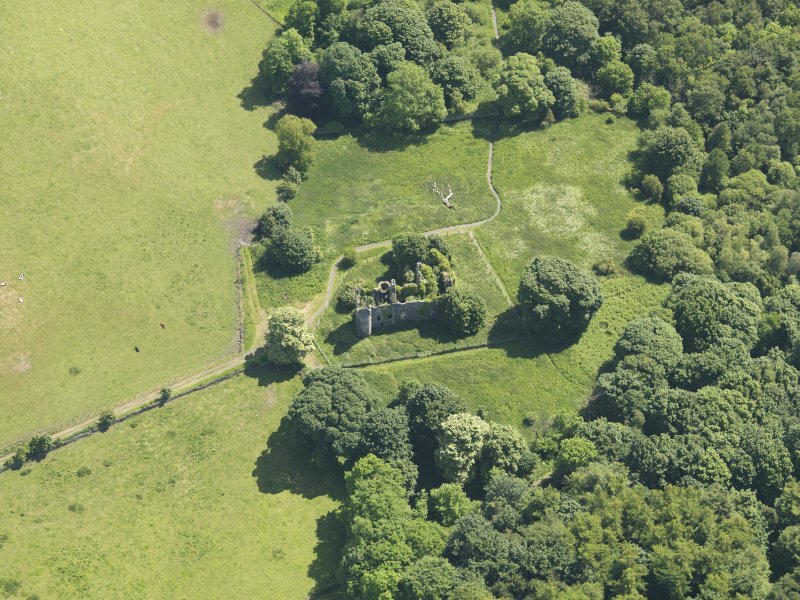 The property was last fully occupied by Susannah, Countess of Eglinton, who died in 1780.